Rev. J. McCLEERY, B.A., S.T.M. TO TELL, in a few words, the long and complicated story of our Non-Subscribing Church, so that it may not only interest children, but give them some sense of the Spiritual back-ground and importance of our movement, is something we should not have attempted had we not had confidence in the ability of our Teachers to adapt it to their needs. To that loyal body of men and women we offer these pages. A. L. A. J. McC. Every Sunday you go to Sunday School and to Church. You know that there are other Churches the same as your own. Perhaps you have been in some of them. All these Churches belong to what is called the Non-Subscribing Presbyterian Church of Ireland. In these few pages we are going to tell you something about that Church. We want you to know how it began, what it stands for, and how it got its name. We should like to tell you about other Churches in other lands which are also part of the same great movement to which it belongs. We cannot do this now, but it is important that you should always remember that your Church is part of a world-wide movement. Our history does not begin in our own country. It goes back to Scotland, from which most of our forefathers came, and indeed to that great movement on the Continent of Europe which is known as the Protestant Reformation. Our Church is the most Protestant of all Churches. We must therefore consider the Reformation and its causes. From the earliest times some people have liked to be told what to believe. Others have always liked to think for themselves. It is easier to be told what to think than to form our own beliefs. For this reason, those who would think for themselves have always been few. Men also like to walk in well-tried paths, and often they have persecuted the few who were brave enough to explore new ways. The whole history of religion repeats that story. In your Bible you read of the Prophets. They were men who gave new truths to the world. Most of them were persecuted whilst they were alive. But after their time men began to believe that they had been right, and Priests were appointed to teach the people those very things which the Prophets in their day had taught in vain. These Priests considered it their duty to prevent any other way of thinking than that which they thought right. But very often what they thought was right was far from the Prophets' real teaching. So when Jesus came, bringing the greatest truths the world has ever known, it was the Priests who led the people to oppose Him. Yet in time His followers appointed their own Priests who told the people what they should believe about Him. They made creeds, or statements of belief, and all who would not "subscribe" or agree to these creeds were cast out of the Church and, indeed, were sometimes put to death. So things went on for many centuries. But at last, in the year 1517, a man called Martin Luther led that great movement called the Protestant Reformation. He declared that Priests were not needed, because every man should be his own Priest and read the Bible for himself. But men's minds did not change. At Geneva in Switzerland, John Calvin, though a Protestant, drew up a system of religion in which men were compelled to believe, and it was so widely accepted that the work of Luther was largely undone. We have said that our Church in Ireland is the most Protestant of all the Protestant Churches. How it came to be so, why it is that the Non-Subscribing Presbyterian Church has the Bible as its only creed, and how it escaped being bound by the fetters of Calvinism, is the story we have to tell. The Protestant Reformation came to Scotland mainly through the work of John Knox, at a time when that country was backward, badly governed, and very poor. Knox was a popular preacher and a born leader, and with the people behind him, his movement of Reform was begun and carried on against the Priests and rulers of the Catholic Church. His victory pledged Scotland to the Protestant religion. Now Knox had been much influenced by Calvin, but his conflict with Royalty and the Bishops of Scotland had served to dull much of his Calvinism. Questions of belief became of less importance to him. It was Presbyterianism that mattered. Later we shall tell you what is meant by Presbyterianism. For the present we will describe it as the rule of the Church by the people, instead of by the Bishops. After the death of Knox, King James VI of Scotland decided to do away with the Presbyterianism that had become the form of government in the Scottish Protestant Church. He preferred the rule of Bishops, and was a strong believer in the maxim, "No Bishop, No King". But his people would not give up the Presbyterian form of government. They resisted the King, and some of them left their native land to find refuge in Antrim and Down, across the "Waters of Moyle". These were the first Presbyterians to come to Ulster. A few years later, in 1610, the plan of colonising the North of Ireland, known as the Plantation of Ulster, was put into operation. As a result, vast numbers of people from Scotland and England began to arrive in Ulster. Settlers came in hundreds, and with them were ministers and laymen, who had actually been banished to Ulster because they held so strongly to Luther's principles. It was these ministers who laid the foundation of Irish Presbyterianism. For conscience sake, in Ballycarry". Just before his death, Brice and other ministers were asked to submit themselves to the rules of the Episcopal Church in Ireland, but such was their spirit, that they refused, and as a result were not allowed to preach again. One interesting story of this first persecution of the early Presbyterians in Ulster is that of the voyage of the *"Eagle Wing". This small ship of about 150 tons, was built at Groomsport, Co. Down, by Presbyterians who were prepared to cross the Atlantic to find in the New World a refuge from persecution, like the men and women of the "Mayflower" some sixteen years earlier. The ship was completed and provisioned, and when all was ready on September 9, 1636, a little company of about 140 people went on board. The "Eagle Wing" weighed anchor, rounded the Gobbins and bore out for the open sea. Before long, contrary winds drove her into Loch Ryan, but she sailed again and soon the Ulster Pilgrims were clear of Ireland and steering west for the New World. Then came fearful weather, which made havoc of the little "Eagle Wing". The rudder was broken, the sails were torn, heavy seas swept over the deck, a leak was sprung, and finally the captain declared it was impossible to face the storm any longer. The ship was put about and in miserable plight they headed back again for Ireland, feeling that God wished them to return to continue the fight for liberty at home. The "Eagle Wing" dropped anchor in Carrickfergus Bay on November 3, 1636. So ended an adventure which shows the spirit and courage of our forefathers. Small wonder then, that in spite of persecution, they persevered in their opinions and finally established the way of thought and Church government which is ours today. *Some scholars are of the opinion that the "Eagle Wing" was built at Carrickfergus. In the year 1641, the native Catholic Irish, under Phelim O'Neill, made a great attempt to drive out the Scottish and English settlers. The full fury of this Rising was felt in Ulster, which became a "field of blood". To protect the Protestants, it was arranged that a Scottish Army should be sent to Carrickfergus, and in 1642 several regiments arrived, each with its own Chaplain. These men decided that Presbyterianism should now be put on a sound footing, and in June, 1642, there took place the fast Presbytery meeting ever held in Ireland. This was at Carrickfergus. It was composed of five ministers and four ruling elders, and at that first meeting various arrangements were made to strengthen the Presbyterian cause. The Presbytery made visits to various places in which Presbyterian Societies had formerly existed, and they set up new congregations. 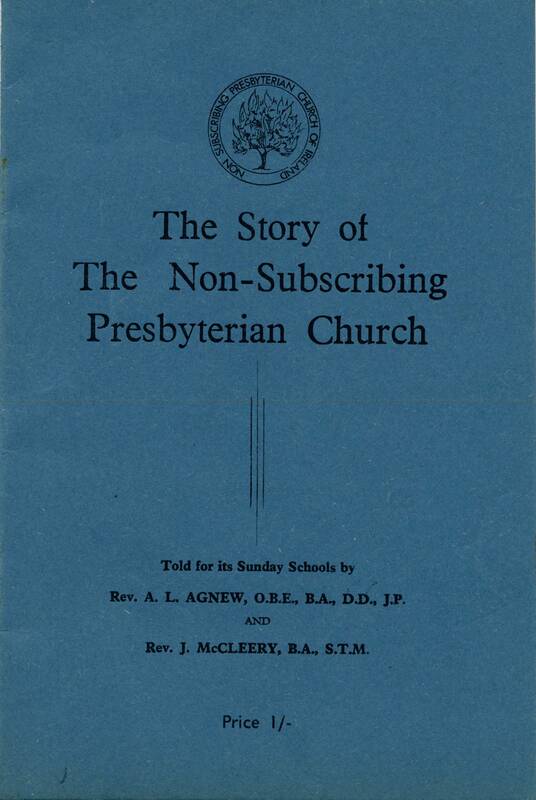 Several of these exist until this present day and form part of our Non-Subscribing Presbyterian Church, such as Belfast, Cairncastle, Holywood, Larne and Templepatrick. Thus did Presbyterianism begin over three hundred years ago. Now that we have told you how the first Presbytery came to be formed, we will try to explain as simply as possible what a Presbytery is, and what Presbyterianism is. Many people think that Presbyterianism is a form of belief. That is not so. It is a form of Church Government. In the Presbyterian system every Church is free to manage its own affairs, under its own minister and elders elected by its own people. But there must be something to hold all the different Churches together. Therefore the ministers with one elder from each congregation in a district meet from time to time to discuss things of-interest to them all. This is called a Presbytery. The Presbytery looks after all those Churches which need help. It sends a minister to preach where a Church has no minister of its own. It advises all the Churches belonging to it, and sees that their affairs are properly looked after. It does many other things. You will see that this is a good system of government. All the ministers and elders are equal, whether they come from large Churches or small ones, and their only concern is to help one another. The different Presbyteries meet together once a year to form a Synod or Assembly to deal with matters affecting all the Presbyteries and Churches in the country. Some Presbyterians have always considered that Presbyteries and Synods should try to make all the Churches and people believe the same things. Others have just as firmly held that they have no right to do this. Here we touch on the difference between Subscribers and Non-Subscribers. The Subscribers require their ministers to sign, or "subscribe" their names to a certain form of belief. We, the Non-Subscribers, allow our ministers and people to form their own opinions about what the Bible teaches. by it. But there was no struggle in the early days. The Presbyterian Church at its beginning was as true to the Lutheran principle of the Open Bible as the Non-Subscribing Church to-day. It is the Non-Subscribing Presbyterian Church which still carries on the principle of the Reformation which those first Presbyterians brought to Ulster. 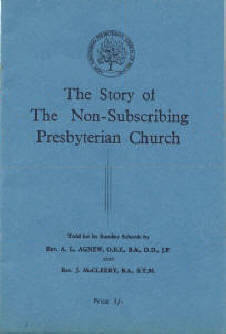 For some years after the forming of the first Presbytery, the Presbyterian Church grew and flourished. More and more ministers came from Scotland, and more and more Churches and Meeting Houses were built. But dark days were soon to come. Troubles in England in the days of Cromwell and Charles II, which you may read of in other histories, led to several attempts being made to impose the rule of Bishops on the Ulster Presbyterians. It was then that some of the persecuted ministers fled to America, and along with them went many members of their congregations. In the new land they established towns with the old Ulster names such as Belfast, Derry, Bangor, and Hillsborough. Their first action when they did so was to establish Churches, and in many of those Churches today the same freedom of religion is upheld as in our own Churches. Some of our ministers have preached in them, and sometimes their ministers visit our Churches here. Soon events took place which bound all the Protestants in Ireland together, whether they were Presbyterians or Episcopalians. In the streets of Comber, Co. Down, a letter was found stating that a massacre of Protestants was to take place on December 7, 1688. General alarm spread over Ulster, and at Derry, where many of the Protestants had taken refuge, the gates were closed and remained so for. one hundred and five days. This was the famous Siege of Derry. In June, 1690, King William III landed at Carrickfergus and, as he passed on his way to the Boyne, he renewed at Hillsborough Castle the grant of money to the Presbyterian ministers of Ulster, known as the "Regium Donum", or Royal Bounty. This was paid to all Presbyterian ministers until the year 2869. When the "Regium Donum" ceased, lump sums were given by the Government to the ministers who had formerly been paid this yearly gift. Some ministers handed over the money to their Churches, and some of our congregations still benefit through this action of those ministers. Unfortunately, after the victory of King William at the Boyne, the unhappy divisions between the Protestants in Ireland broke out once more. Trouble and persecution by both sides continued until the Act of Toleration in 1719. It would be unfair to blame one side more than the other for these things. Each party persecuted the other in turn when opportunity arose, and no sooner had Presbyterians become free from outside troubles than they began to have others of their own. From its beginning until now, Presbyterianism had remained true to the principles of the Protestant Reformation. In Scotland, however, the Presbyterians had deviated from the open Bible and had become strict followers of John Calvin. Scottish ministers now signed, or "subscribed" their names as a token of belief in the Westminster Confession of Faith, which contained the doctrines of Calvin. Many of these ministers came to Ireland, bringing with them the influences of their native land, and soon Calvinism had become the popular belief of the Presbyterian Church in Ireland. No serious attempts were made to make it compulsory as yet. Soon, however, such attempts were to be made, and to be bravely resisted, and so began the dispute between the Subscribers and the NonSubscribers. John Abernethy, the young minister of Antrim, was opposed to all attempts to introduce Subscription, and in 1719 he preached a famous sermon in Belfast, in which he denied that the Church had any right to make people subscribe to statements of belief. For preaching this sermon, he was accused of attempting to give New Light to the world, and from this time the Non-Subscribers were known as "the New Light people". The installation of the Rev. Samuel Halliday in the Church at Belfast, took place a year later, in 1720. When Halliday came to Belfast he refused to subscribe, and this brought the matter to a head. By this time, the Synod of Ulster had been formed, and at the next Annual Meeting of that body in 1'721, it was urged that all Ministers should subscribe to the Westminster Confession of Faith. Those who opposed this, and contended that there should be n0 creed, except the Bible, were known henceforth as Non-Subscribers. For some years there were many disputes between them and the Subscribers. In 1724 Thomas Nevin, minister of Downpatrick, was called on to make a declaration of his belief, but steadfastly refused. He was expelled from the Synod, but remained in charge of his congregation. In 1726 the whole matter ended for a time, when seventeen ministers and their congregations were excluded from the Synod and formed into the Non-Subscribing Presbytery of Antrim. In that Presbytery ever since, the original contention, "that human creeds and confessions restrict the right of private judgment", has been faithfully maintained. But the old spirit 0f independence was very strong, and it had not been got rid of by excluding the Presbytery 0f Antrim. By the year 1783, ten 0f the fourteen Presbyteries which then composed the General Synod of the Presbyterian Church had ceased to demand Subscription, and in 1805 there was almost a reunion of the divided Presbyterians. Again in 1824, the Synod adopted a Code of Discipline which would have satisfied all, and a great liberal Presbyterian Church might have been built up, with untold benefits for the whole of Ireland, but for a succession of events and but for two great rival personalities who now appear upon the stage of Presbyterian history. "We have come together to prove that we are genuine Presbyterians . . . assertors of the right of private judgment, uncompromising advocates of the all-sufficiency of the Bible as a Rule of Faith and Duty.... Christ, and Christ only, is our King ; the Bible, and the Bible only, is our accredited standard of belief". There was one man whose ambition was to build up a strong Church at all costs. He was convinced that only by enforcing unity of belief, could this be attained. His name was Henry Cooke. But the Non-Subscribers also found a champion : this was Henry Montgomery, known as "the Lion of Dunmurry". These were two of the greatest orators Ulster ever produced. Both of them were men of commanding appearance. Montgomery was six feet four inches in height. You will probably have seen his portrait about your Church. The statue of Henry Cooke stands in College Square, Belfast. Montgomery waged a continual fight for liberty, not only for Non-Subscribers, but for his Roman Catholic fellow countrymen, who in those days were greatly oppressed. Cooke on the other hand, put the glory and power of the Presbyterian Church before all else. The Synod Meetings of these times were the scenes of great duels between these famous men. In the end Cooke was victorious. Montgomery, with sixteen other ministers, left the Synod to form, in 1830, the Remonstrant Synod of Ulster. It was called "Remonstrant" 'because it remonstrated against people being compelled to subscribe the Westminster Confession. "We are now compelled ... in obedience to the dictates of conscience ... in vindication of our own rights . . . in defence of religious liberty, and to avoid being accessory to the suppression of the truth of God, to separate ourselves from the General Synod of Ulster, and to remain separated, until that body shall have returned to the Scriptural principles and usages of Presbyterianism". During the years that followed, several new congregations were formed, and it is worthy of mention that in 1843 a minister was ordained in York Street Meeting House, Belfast, for a new Church in Montreal, and that a Presbytery of Canada was connected with the Remonstrant Synod until 1856. The Churches in Toronto and Montreal still remember the old links that bound them to the Non-Subscribing Church in Ireland. and thirty-four congregations. All these congregations together form and constitute the Non-Subscribing Presterian Church of Ireland. Such is the story of the Non-Subscribing Church, so far as it may be told in a few pages. But remember that there are many more things about it that you will have to discover for yourselves. The more you learn about it, the better you will be able to serve it in the days to come. You will discover why it is not a large Church. It was built up by men who cared little how many were with them, if they themselves were faithful to what they believed to be right. Such men were brave, and the brave are few. But because it is not a large Church, it needs your loyalty and courage all the more, so that it may continue to bear witness to the right of men to think for themselves. Now, as never before in the history of the world, that right must be fought for, and there is no principle more valuable today than that for which our Non-Subscribing Church has stood, and must stand in the days to come. That the Scriptures of the Old and New Testament are the Rule of Christian Faith and Duty under the teaching of our Lord Jesus Christ. That it is the inalienable right of every Christian to search these records of Divine Truth for his own instruction and guidance, to form his own opinions with regard to what they teach, and to worship God in sincerity, agreeably to the dictates of his own conscience, without privation, penalty or inconvenience inflicted by his fellowmen.